This was my first big race of the year and in the months leading up to the race things in training had been going well. This always makes me nervous leading into a big race, because I worry about putting pen to paper as it were, and transferring good form in training into an actual result. It is one thing to say ‘you are in good form’ and another thing to actually deliver on the day. Time and time again in previous races I have failed to deliver the goods, but this time around things felt different. I started to really believe I WOULD not could deliver on the day. It then all went horribly wrong. Monday – before the OUTLAW I got hit but vomiting and diarrhea in the very extreme. On Tuesday I was a complete mess and spent most of the day in bed. Mentally I was shot – convince I would not be able to race on the weekend. BUT, the body is amazingly resilient machine and come Wednesday I was feeling back to normal. The next battle was in my mind, to hunt out those demons of doubt and crash them. It took time but come Friday afternoon I was back – physically and maybe more importantly mentally ready for the race on the weekend. 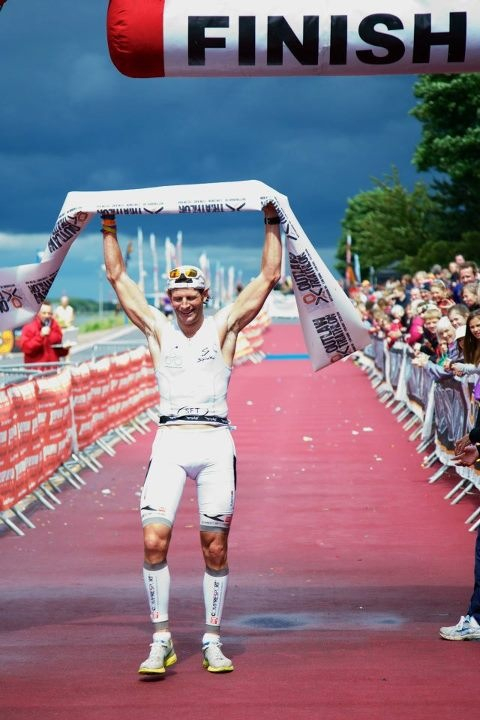 I had seen the press about Harry Wiltshire racing and having looked at his stats from UK 70.3 2012, I was guessing he would put at least 5-6mins into me on the swim. I was convinced he would not put any time into me on the bike. That meant if I was right, it was going to come down to the run. In nearly every single triathlon race I have ever done I have ALWAYS lost places on the run. It has happened with such regularity that I have come to expect it. This has made we mentally soft out on the run course, where I am simply trying to ‘hold on’ to the position my swim – bike has put me in, with no thought of catching the guy(s) in front. No way to race. The way I see it is this – My running is not that bad, I just need to have BELIEF that I can RUN WELL and catch the man in front of me. My mum sent me a text that afternoon which I think I will remember for a long time. It simply said – “believe you can fly!” It struck a real cord and although I have to admit R Kelly “I believe I can fly” is not the most motivational song in the world, I made a mental note of taking that thought we me – BELIEVE YOU CAN FLY CHRIS, BELIEVE YOU CAN FLY!!!!!. The swim was solid. I could see a swimmer shooting off the front who I guessed would be Harry. I am not a fast starter, so I slowly worked my way through to the front of second lead group. At the turn around the group was down to three. The return leg was SLOW going. I spent my time just trying to stay relaxed and not push to hard. 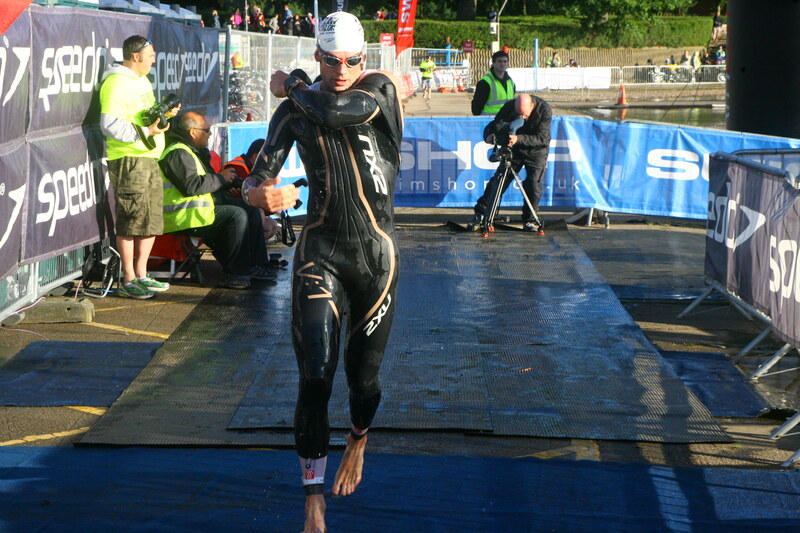 I was out of the water in 54:30 and had a slow transition of almost 3 mins (really got to work on speeding up my T1). I hit the road 7mins down on Harry. As I headed out on the bike I have to say I really did not feel that good. In previous races, I normally feel MUCH more comfortable at this stage. Instead of worrying about it, I focused my thoughts firmly on the road, staying smooth and relaxed. I was confident my legs would wake up eventually – they did. After being out on the road for about 1hr a camera crew pulled up along side me on a motorbike. I have never been filmed while racing before and it is the most surreal feeling in the world. At times the cameraman was leaning right down and the camera can only have been a couple a feet away. At that point I was on a fast section of road and all this was happening at speeds of 25 to 30mph!! It kind of felt like you should look into the camera and wave or something. But of course you need to keep your eyes firmly on the road in front of you! After a few minutes I was please to see the camera crew head off and allow me to fully focus on the road in front of me, and the race at hand. As it turns out, I would see a lot more of them as the day went on! As I crossed into the 4hr mark and the end of the bike course I was still feeling solid and the legs were holding power at ‘race pace’. It was going to be a slower bike split than I had expected, 4:50ish, but man it had been windy out there! Some of the strongest winds I have ridden in for some time and driving into those head winds was HARD! Very glad to be riding the ENVE 8.9’s wheels in conditions like that. These deep rim wheels have been specifically designed to cope with strong cross winds and trust me, they do! With about 10 miles to go, I backed off the power and started to mentally prepare myself for the run. As far as I was concerned, this was where the race was going to start. Coming out of T2 I got the news I was 7mins down, so my race prediction thus far had been pretty much bang on the money. I felt fantastic. 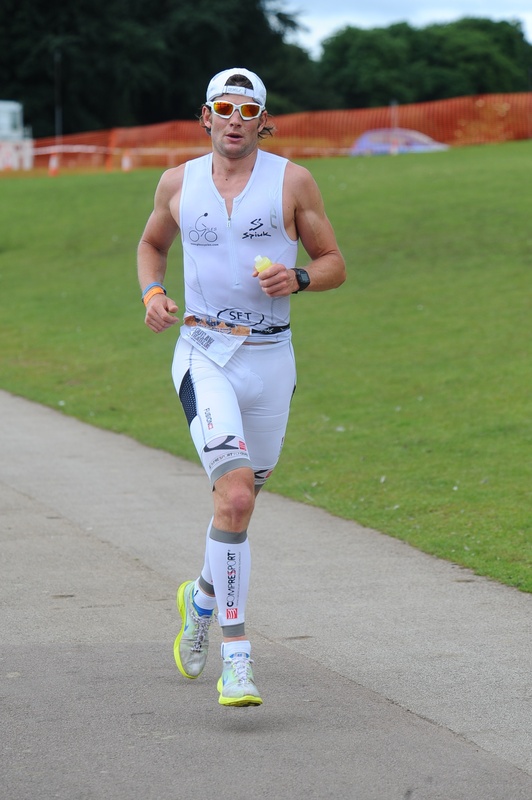 The best I have ever felt coming out of T2 in an Ironman distance race!! I was light on my feet and without pushing at all found myself running at 3:55/km pace up the reservoir. Turning to come back towards the start you were greeted by a huge head wind. Suddenly the air seemed to thicken up. Runner always take about hitting ‘the wall’, well the only way I can describe running into this head wind was like running into a brick wall. Thankfully as you left the reservoir and went onto the trail into town you finally got some shelter from this wall of wind. At the stage of the run I was still feeling strong. Relaxed with one sole focus in my mind – catching the man in front. For the first time ever, I did not give a seconds thought to the people behind me. As I neared the turn around point at the town hall I crossed paths with Harry for the first time. I made a mental note of where we had crossed and it took me 5mins to reach that point again. I had made up 2 mins in about 10km! We had 32km of the run left. At this point, and probably for the first time ever in a triathlon run – I BELIEVED in myself and that I would ‘catch the man in front’. The return leg back to the res. went very quickly and I was soon running into that wall of wind again. As I reached Carli I found out the gap was back up to 6mins 50secs. I had been running well so he must have put in a big burst in the last 5km. Back to square one. Still, there was plenty of running left. For the remainder of the run I continued to push as hard as I could, but the wheels were slowly coming off. I think the gap stayed at around 7mins for nearly the rest of the race. I think I knew, with about 10km to go, it was unlikely that I would catch him. But part of me still held onto that belief. My body was really struggling, but my mind was in a positive state telling my body to pipe down – keep pushing, anything can happen! As I hit the res. for the last time I put in one final surge in the hope that he might cramp up and have to walk. The last few km were into the wall of wind. I was in a lot of pain and running as hard as I could. I had the camera crew with me again for that last final run in. I was pulling all sorts of faces and running with my eyes closed quite a bit. I tried to picture myself running up the mountains in Zermatt and this kind of helped take my mind off the pain. I think I made up a couple mins in the last 3-4km but it ended up being to little to late. It is always a great feeling running down the finishing chute. This one though, was a little bit more special. It had been a near perfect day – almost. OK, it would have been a fairly tale ending if I had managed to take the lead and win, but to just be in the mix and part of ‘the race’ left me walking away from today a very happy man. I have COMPLETED 14 Ironman distance races over the last 7 years and I can honestly say that this was the very first time I have actually RACED one! 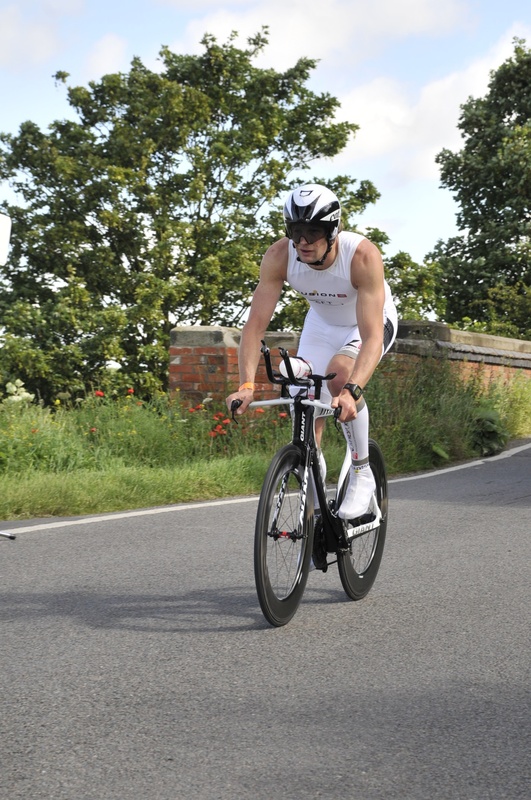 Hats off to Mr Wiltshire – awesome performance out there and thanks for making it a great race. To the OUTLAW team – guys thank you for making the event such a success. It must have taken a huge amount of work but it all paid off – awesome event. Not one to dwell on the past to much I have got a weeks R & R, then I start ramping things back up ready for Challenge Copenhagen 2012. Time to make that jump……. By the way – For any of you that might be interested in seeing my ugly mug running around in lycra, the OUTLAW will be showing on Channel 4 on Sunday 12 August, ironically the same day a Challenge Copenhagen. I will have to sky plus that one! Chris your triathlon tales are inspiring. I don’t know how you do it! I wish you all the best for Copenhagen. Congrats on your second place!